The truly one-of-a-kind, theatrically over-the-top dining experience at Barton G is nothing short of amazing. As servers bring enchantingly artistic culinary presentations from the kitchen to the table, the dining room fills with oohs and ahs. Every diner enjoys a glamorous and unique evening of avant-garde dishes complete with vaporizing cocktails. If three-foot-tall desserts and outlandish presentations are not your cup of tea, perhaps Barton G might not be for you. These dishes demand attention. The elegant décor is embellished with white textured felt walls and wood square paneling made from recycled wine barrels. Rows of single orchid flowers in small clear vases adorn the walls and taupe colored drapes are elegantly drawn back. Raised silver plated placemats embossed with the signature “B” invite diners to be seated. Who is Barton G? The man behind the moniker is concept designer, restaurateur, author, and hotelier, Barton G. Weiss. He stages the most extravagant weddings, sports, entertainment and fashion events with an element of surprise and elegance. He also has been a guest judge on the popular television show “Top Chef”. Barton and executive chef Jeffrey O’Neill at The Villa by Barton G, housed in Versace’s former Ocean Drive mansion, wow guests in Miami and now they impress diners in Los Angeles. The whimsical marble bar near the front of the dining room is a hub for servers gathering smoking martinis with names like Diamonds are Forever and Buddahlicious. These signature cocktails come from Barton G’s Below Zero Nitro-Bar and are crafted with liquid nitrogen—adding both a refreshing chill and high drama. Friends ordered one of each and applauded when the cocktails arrived. Diamonds are Forever is made with citrus vodka, triple sec and lemonade. It’s served with a vodka Popsicle and sugar stick to stir into the vaporing cocktail creating a sweeter and more potent libation. There is a sparkling votive candleholder on the mirrored cocktail tray to hold your Popsicle stick after the vodka dissolves. 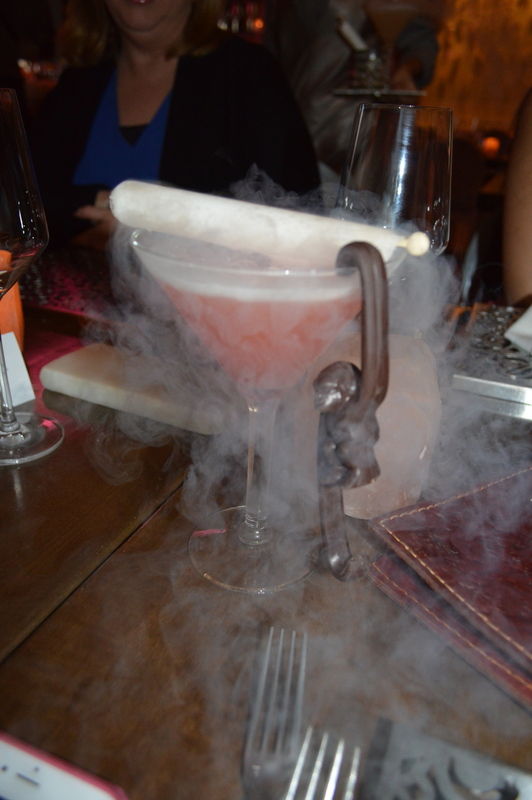 In the Buddahlicious drink, pear infused vodka is mixed with lychee and cranberry juice and served with a nitrogen Popsicle of pear vodka and a small golden Buddha. Rub his tummy for good fortune. I ordered the signature Sabrinatini martini served with a nitro-champagne swizzle stick and a solid chocolate monkey hanging down the side of the glass. Sipping our drinks, we commented on every extravagant dish that left Chef de Cuisine Attila Bollok’s kitchen, especially the more whimsical plates with gigantic fishing lures standing upright and three-foot-tall silver forks. Dining at Barton G is elegant dinner theater with the culinary creations as the starring act, thrilling your senses with both their jaw-dropping presentations and their heavenly aromas and flavors. By 7:30 p.m. the restaurant was full of families celebrating a birthday, couples on dates to impress, and groups snapping photos to post on Instagram. These dishes are guaranteed to get many “likes” on your social media accounts because no other restaurant in Los Angeles offers artful cuisine on such a grand scale. 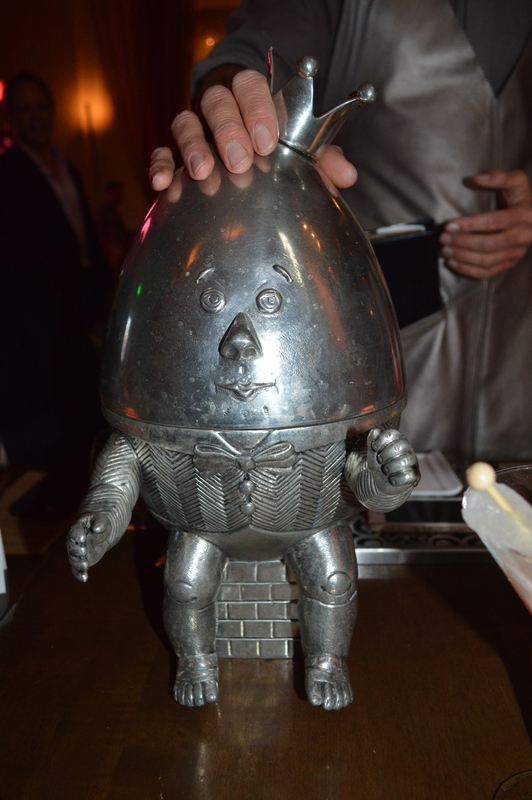 For example, the caviar cannoli appetizer is presented in a giant silver Humpty Dumpty serving piece filled with ice. Remove the top and find a plate of small rolled cannoli shells filled with black caviar and decorated with edible flowers. “It’s all about having fun and letting go,” Chef Attila said. 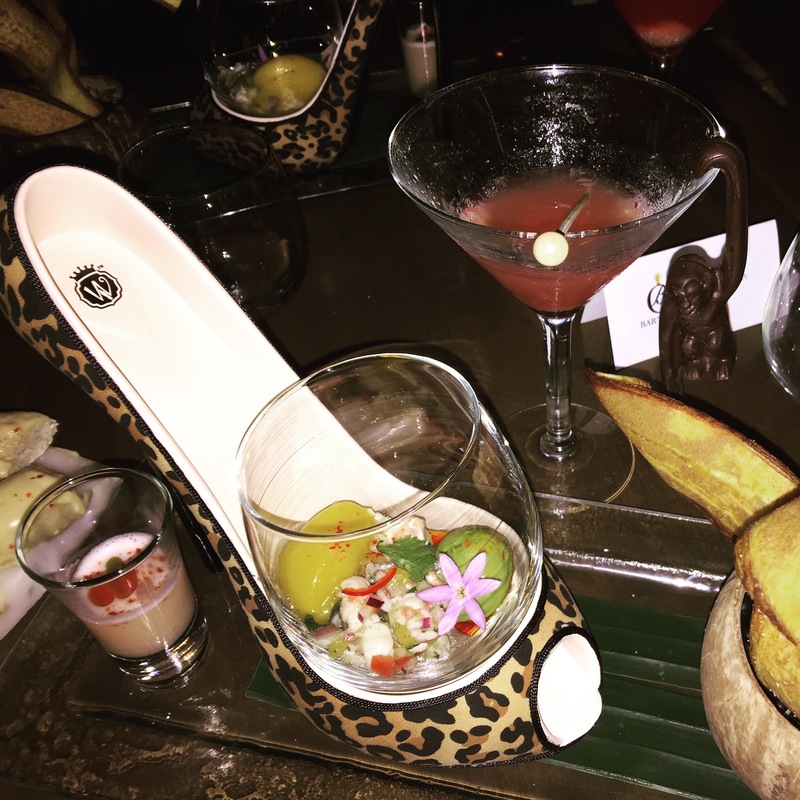 The fresh line-caught halibut ceviche is served in a clear glass and placed into a leopard print stiletto heel. This cold appetizer is mixed with a dollop of mango sorbet and small laughing bird shrimp. These crustaceans are sweet and raised without antibiotics or hormones. Chef Attila marinates the shrimp and halibut in leche de tigre (a citrus-based infusion) for an hour, then drains the liquid and pours it into a shot glass to serve with the ceviche in the shoe. Guests are to drink the shot before scooping the avocado mousse, mango sorbet and ceviche with a plantain chip. Chef Attila also fries laughing bird shrimp and presents them in a large carnival-style popcorn machine with Old Bay spiced popcorn. Guests can dip the crispy treats into a Sriracha aioli or sweet chile sesame dipping sauce. It’s a fun, unusual appetizer to share with others. The chopped sunflower salad, served in a large wooden bowl, includes arugula, sunflower petals, purple cherries and sunchokes dressed in a slightly sweet stone-fruit vinaigrette. 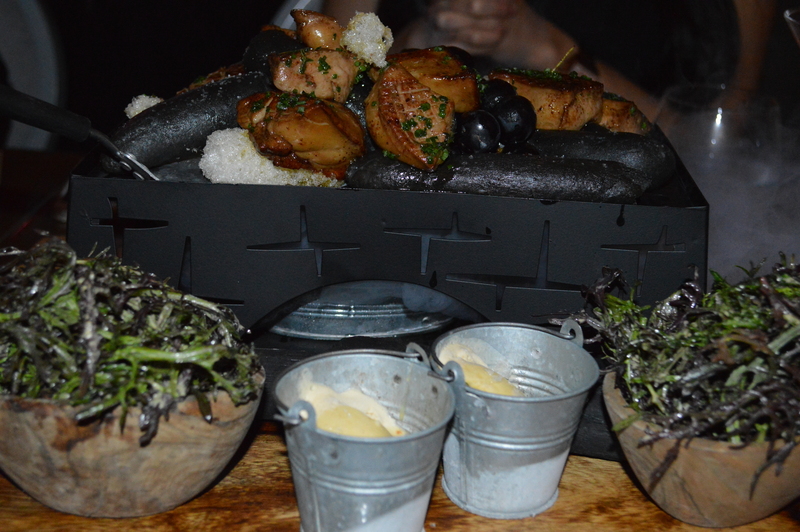 The soy marinated and coal roasted foie gras balances hot and cold temperatures and varying textures. The tender and rich foie gras is served with warm, smoked, seedless grapes and cold scorched honey and pistachio gelato and accompanied by black sourdough “charcoal” bread sticks. After a three-year ban on foie gras, O’Neill and Chef Attila wanted to hype up the classic dish with the deeply smoky bread and fruit to raise the flavor profiles. They succeeded. Porcini pizzeola, a delightful, umami-forward vegan dish, is served with a potted green plant and a side of eggplant puree and chickpea croquettes. Barton G’s quirky creativity shines with the lobster pop tarts, which are brought to the table in a retro-toaster resting in the two-slice heating frames. These pop-tarts, however, are made with crispy phyllo pastry, Pernod mornay sauce, and fresh Maine lobster. Lobster lovers will also adore the creamy lobster trap truffle-mac n’ cheese made with a generous portion of large pieces of perfectly cooked lobster and mixed with a smooth and exquisite three cheese lobster sauce. Our server, Hristina, was very professional and friendly, explaining the ingredients in each dish. When I looked with intrigue at a smoking treasure box at a nearby table, Hristina told me it was filled with chocolate. The treasures included a Valrhona 66 percent double chocolate bittersweet brownie with house-made Tahitian vanilla bean nitro ice cream, rich chocolate ganache and gold dusted chocolate spoons. As the dessert service continued, I was in awe over Barton G’s “Let Them Eat Cake” tribute. 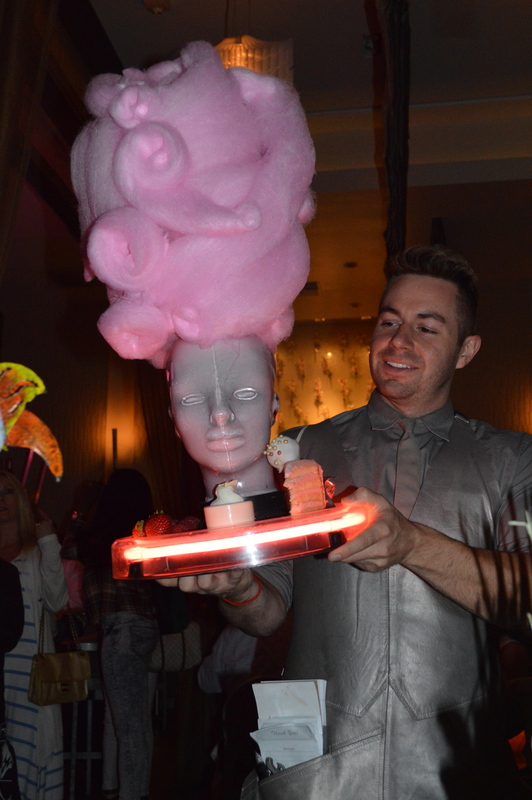 A silver Marie Antoinette bust was placed before me with an elaborate hairdo of pink cotton candy piled over two feet tall and styled like a wig. Several delightful petite cakes surround the dish. I marveled at the baked Alaskan Everglades dessert with a large croaking neon eyed frog and a huge piece of seven-layer red velvet ice cream cake, wrapped in toasted meringue and topped with a full size candy apple to represent the ‘cherry’ on top. My jaw dropped one last time when a three-foot tall whimsical bird arrived on a platter with four different double chocolate sponge cake bombs. The dessert, “Crazy Bird Gets The Worm” offers cakes of butter toffee, chocolate mint cream, banana praline, and a peanut butter powder with crackling snickers inside. When it comes to innovative cuisine and over-the-top glamour in Los Angeles, it doesn’t get better than Barton G.
$$$ Open Sunday through Thursday from 6 to 10 p.m. Friday and Saturday the restaurant is open until 11 p.m. 61 N. La Cienega Blvd. (310)388-1888.